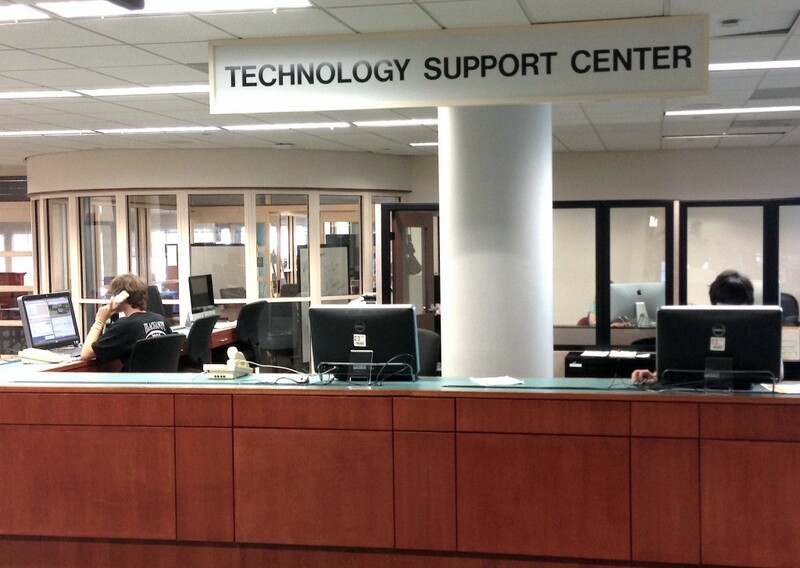 The Technology Support Center (TSC) assists all members of the UMBC community with their technology questions and requests. Many questions can be answered over the phone during your initial call. Others may require the submission of a Request Ticket, and, if necessary, a DoIT employee may be sent to your campus location for on-site assistance. Self Help: Log in at my.umbc.edu. Under the “Help” dropdown menu, enter the topic of your question in the “Search the FAQs” field. You will be taken to a page where you will find helpful information and how-to instructions regarding your topic. Request Help Online: Log in at my.umbc.edu. Under the “Help” dropdown menu, click “Request Help” and describe the problem. Once submitted, a “ticket” with a unique ID number will be created. This can be used to track the status of the resolution of your issue. Walk-in Support: The TSC is located on the first floor of the Albin O. Kuhn Library, immediately to the right of the main entrance. Click here for the TSC’s Hours of Operation. Apple at UMBC: We’re here to help students, parents, faculty, and staff purchase technology that will help them succeed during their academic careers and beyond. Click here for more information. Working at the TSC: Students interested in working at the TSC are encouraged to follow the DoIT group in myUMBC where we post any announcements about job opportunities. When hiring, applications to the Technology Support Center may be submitted via UMBCWorks. A job description is available here. Are you looking for an on campus job? Come work for us! Try out a few of the laptops available from Apple and Dell!